Lightning is the number one cause of catastrophic failures in solar electric systems and components. The first major reason is that many PV systems are poorly grounded and poorly protected. That is also the 2nd and 3rd major reason. All photos courtesy of NOAA unless otherwise noted. Click on pictures for full-size image. The purpose of lightning protection is NOT to stop the lightning from striking. You can't do that. Lightning protection controls the PATH of the lightning after it hits. Like it or not, that is about the best you can do. It's not lightning that causes the damage, it's lightning going through places you don't want it to. At any instant, there are more than 2,000 thunderstorms taking place throughout the world. These storms combine to produce about 100 lightning flashes per second, each one with a potential of up to a billion volts, currents ranging up to 200,000 amperes and temperatures of over 54,000 degrees Fahrenheit. 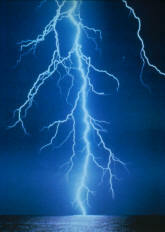 One hundred million feet per second is the quickness of the lightning streak through the sky. No wonder the flash is difficult to watch from beginning to end; it starts and stops at almost the same time. Lightning travels 90,000 mi/sec (nearly 1/2 the speed of light), 100,000 times faster than sound and therein lies the reason thunder is heard after the flash is seen. The stroke, which is about two inches across and between 200 feet and 20 miles long, lasts but a microsecond. Lightning likes land. According to images of data from NASA's Lightning Imaging Sensor (LIS). From December 1997 through January 1998, LIS saw that 90 percent of lightning was over land. Almost nothing can offer 100% protection from lightning strikes or damage - but it can be reduced 95% or more with simple precautions and relatively inexpensive installation methods. There are a lot of myths about lightning. Some have persisted for centuries. Some really silly ones seem to stay around forever. A few of the more popular ones are below. Myth- It will have little or no effect on how likely it is that it will strike in the immediate area, the important thing is it will be conducted directly to ground, without having to go through your inverter and computer first. It does make it more likely to strike where you want it to. 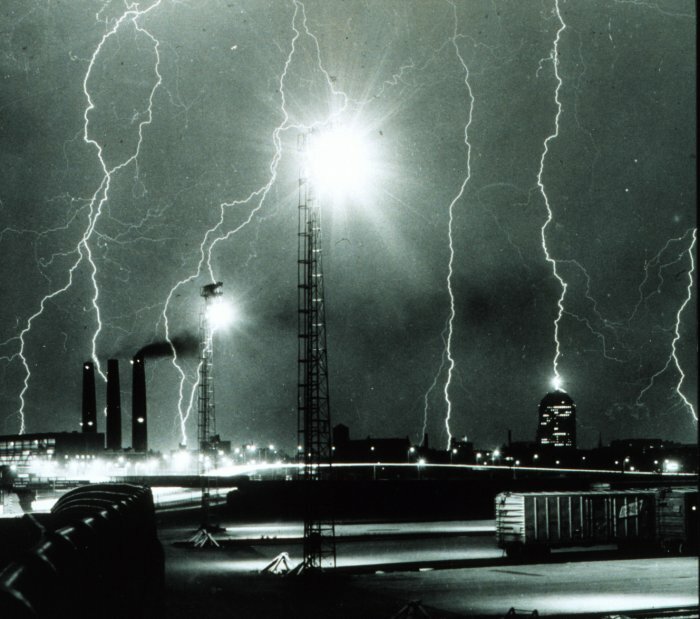 There is some evidence that a few strikes can be prevented with the use of special sharp-pointed "air streamer" lightning rods, which bleed off some of the accumulated charge. However, that has been a controversy for at least 50 years. Myth - It can strike anyplace - although it is most likely to hit the highest object, there is no guarantee. It is also more likely to strike something with a good path to ground, such as a steel tower. Sometimes, even if it strikes the highest object, you can get side flashes if the object it hits is not well grounded. Lightning Myths: Lightning doesn't strike the same place twice. As can be seen on the map at the right, lightning can strike anyplace. Obviously, some areas are much more active than others - in fact, Florida is usually considered the "lightning capital" of the world - second only perhaps to some areas of Australia. 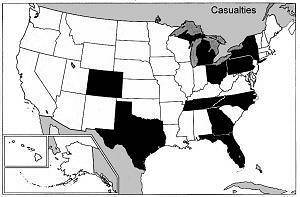 This map does not show the relative intensity, so it can be a little misleading. 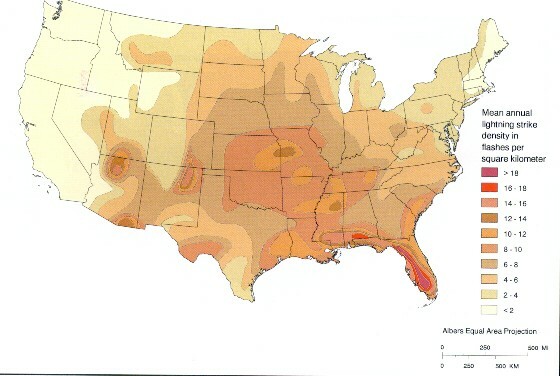 Although the Southwest does not rate that high in the total number of strikes, some of the largest strikes ever recorded are from that area due to the sometimes violent updrafts from the super-heated desert floor. What Kind of Damage can Lightning Cause? Most electrical and electronic damage in both grid-tie and off-grid solar electric systems is NOT due to a direct hit. In fact, direct hits are rare. Most damage occurs from nearby hits, usually within a few hundred feet. A near-strike can induce thousands of volts onto the house and PV array wiring if not protected. In a ground hit, it can also spread out and travel into buried conductors, such as pipes and buried cables. Contrary to popular assumption, the panels themselves are not the biggest victim - inverters and controllers are. The frames and mounts on panels are usually grounded (sometimes more by accident than design), and that often diverts the lightning directly to ground, saving the panels. Also, the battery banks on most off-grid PV systems act as a fairly good surge arrestor if you have good connections and a good ground - but it may take out the controller on it's way. If the battery bank is not grounded, damage can be much more severe - it may then leap around all over trying to find a path to ground. Objects can be directly struck and this impact may result in an explosion, burn, or total destruction. Or, the damage may be indirect when the current passes through or near it. Sometimes, current may enter a building and transfer through wires or plumbing and damage everything in its path. Similarly, in urban areas, it may strike a pole or tree and the current then travels to several nearby houses and other structures and enter them through wiring or plumbing. In some cases, lightning can strike the ground and travel up buried power lines for hundreds of yards. It is very important to note that lightning does NOT have to hit directly to cause damage. In fact, because of the EMP (electromagnetic pulse) associated with large strikes, the static and electric fields that occur actually cause most of the damage in unprotected electrical and electronic equipment. In a nearby strike, the wiring in a house or photovoltaic system acts like an antenna, and if unprotected and/or ungrounded can feed thousands of volts back into your inverter and other equipment. First off, the NEC Article 780 (NFPA) codes for lightning protection may not be totally adequate for off-grid installations. In fact, the recommended practices can actually make it MORE dangerous. Unfortunately, some local inspectors assume that the National Electrical Code book is a bible and will not allow any deviations. For example, Zones of protection, including cones and rolling balls, lack warnings about lightning's' unpredictable nature. These geometric abstractions are presented as factual, rather than statistical levels of protection. This is not to say that you should not follow the NEC recommendations in most cases - but you should be aware that recent research shows that there might be considerable variations from the average. Further steps may be needed for PV systems. NEC grounding is primarily concerned with electrical safety, not lightning protection, and the two may not always be compatible. For lightning protection, you may need to take steps beyond the code minimum requirements. The Purpose of Grounding: Equipment: Panel frames and mounts are grounded in order to provide the easiest path for lightning to get to the ground. You would much rather have it go down the mounting pole or your ground rod than down your wiring to your controller or inverter or new wide screen TV. Without proper grounding, lightning can do some really strange things and can jump around all over while trying to get to earth. If your inverter happens to be in the way, you will probably be buying a new one. You cannot stop lightning, but you can usually direct where you want it to go. Fuses and Breakers offer NO protection: Fuses and circuit breakers offer no protection at all to lightning strikes. That is not their purpose. Lighting usually lasts for only a few microseconds - much faster than any fuse or breaker can blow. It's pretty unlikely that a one-inch fuse gap is going to offer much protection from a bolt that just cut through two miles of open air. Yet the myth persists that a fuse will offer lighting protection. It will not. Single Point Grounds: The importance of a single-point protection ground cannot be stressed enough. All equipment should normally be bonded to one single good earth ground. If you have some equipment on one ground, and other equipment on another ground, it is quite likely that in a nearby strike that there will be a large voltage difference between the two grounds. This means that the equipment will be at different voltages, sometimes high enough to get arcing from one to another. There is an exception to this: If you have a panel array that is more than 50 to 75 feet or so from the rest of the system, it should have it's own frame/mount ground (not electrical ground). A Single Ground Rod is Seldom Enough: Tests done over the past few years show that in most cases, a single 6 or 8-foot ground rod is NOT enough, even when the ground is salted to improve conductivity. The problem is, in arid climates with dry soil, it could take as many as a dozen rods to get it down to the 10 ohms ground resistance that is usually accepted as the optimum (25 ohms is the NEC minimum). To get down to the 25 ohm NEC minimum, you may have to use 2-3 10-foot rods, all bonded together with #6 wire and copper wire clamps. However, if you cannot do this, something is better than nothing. In some cases, you may have to go so far as to bury lengths of bare copper wire or copper pipe in trenches. The NEC requires that all exposed metal surfaces be grounded regardless of the nominal system voltage. Systems with PV open-circuit voltages below 50 Volts are not required to have one of the current-carrying conductors grounded. Any system with AC voltages at 120 volts must have the neutral grounded. Some inverters do not isolate the AC and DC sides; grounding the AC neutral will also ground the DC negative. Other inverters have the case (which must be grounded) connected to the negative input which grounds the negative current-carrying conductor. The NEC requirement can be extended. A separate conductor (as large as possible, but not less than number 10 AWG) should be fastened to each metallic module frame with a grounding lug or other approved method. The other end of these conductors should be connected to a single point on the array frame or rack â€¹ again with another self-threading, stainless-steel screw or with a stainless-steel bolt in a drilled and tapped hole. From this point, number 4-6 AWG or larger copper conductor should be run directly to the nearest earth where it is connected to the longest, deepest ground rod that can be afforded. Eight feet is the minimum length recommended. Use a UL-listed clamp to make the connection. If a steel well casing is available, drill and tap the casing and use this as the ground rod. In dry areas, several ground rods spaced 20-50 feet apart in a radial configuration, all bonded to the central rod can be effective. Buried copper water pipe can also improve the grounding system. Pipe or copper wire can be buried in trenches 12-18 inches deep in a radial grid. All grounding members should be connected or bonded to the central ground rod with heavy, bare conductors buried underground. Direct-burial, UL-listed grounding clamps or welding should be used for all connections. Soldering should never be used for underground connections - it can corrode underground due to the different metals. You can't get a "perfect" ground unless you are prepared to spend megabucks on buried copper cables. However, a good ground is possible to get in most areas and need not be expensive. In dry and/or rocky locations, it may be more of a "challenge". If you can't get it perfect, ANYTHING is better than nothing at all. If you have bedrock at 3 feet, try driving in 3 to 6 short ground rods and tie them all together with at least #4 wire and good clamps. - not perfect, but far better than nothing. Another way is to bury heavy wire or (usually cheaper) lengths of copper pipe in ditches. Keeping the ground wet and/or salting the nearby area will also help. The negative side of the battery bank should be grounded to the same point as all other ground wires. Batteries usually have a very low internal resistance and can help act like a large surge arrestor on all but a direct hit. This may stop a hit near your panels from jumping around to your inverter and other equipment. The ground wire should be at least #8, and #6 or #4 is recommended. Surge Arrestors, or Surge Protectors, act like "clamps" in most cases. They go across the live wires with another wire going to the ground. Normally they just sit there, but if the voltage goes above a certain level, they start to conduct, shorting the higher voltage to the ground. In lighting prone areas you should also install a surge capacitor - this is not really an arrestor, but acts extremely fast, and will catch those high voltage spikes on the AC line that are too fast for a surge arrestor. For most systems to get the best protection, you should have a DC surge arrestor on the INPUT to the charge controller. It should be as near the charge controller as possible. On the AC side (and this applies to BOTH the inverter AC input and AC output (for generator and/or grid tie systems) you should have both an AC surge arrestor and a surge capacitor. Most inverter damage is caused by surges on the AC side coming in through house or generator wiring. In many systems with a backup generator, the generator is located outside, quite some distance from the inverter, and is a common hit point for lightning strikes. The benefits of also putting arrestors at the generator end are not all that great, and if installed you will probably need a separate ground rod system. For most mid-size and larger systems we recommend the Midnite Solar surge arrestors, or the Outback Power types. It may seem a bit high to spend over $200 on surge arrestors, but the typical repair bill for large sine wave inverter that has been lightning hit can run well over $1000. Please email us if you have any comments or corrections for this page.